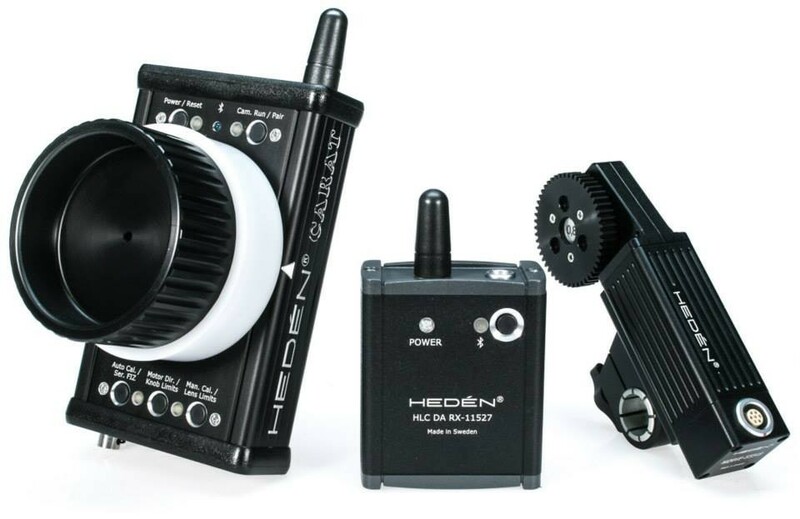 The Heden Carat is a digital professional pocket-sized wireless remote focus/iris system. Bluetooth via ConnectBlue / Ericsson radio secure wireless link enables extreme range of up to 1000m. Extremely fast and responsive. No visible latency. Auto intelligent or manual calibration of lens. Easy to setup and use. For left or right handed use. Ultra compact receiver and hand unit with several mounting options. Quick change scale rings. Optional glow in the dark scale rings. Remote camera R/S for most film & HD cameras. Native support for RED Dragon, Epic & Scarlet. USB interface for software upgrades and personalized user settings via Heden PC GUI. Optional smartphone/tablet app. Outstanding quality and robust design. Control F/I/Z internal digital lens motors on all Fuji Cabrio & S6 lenses via built-in serial interface on receiver unit.